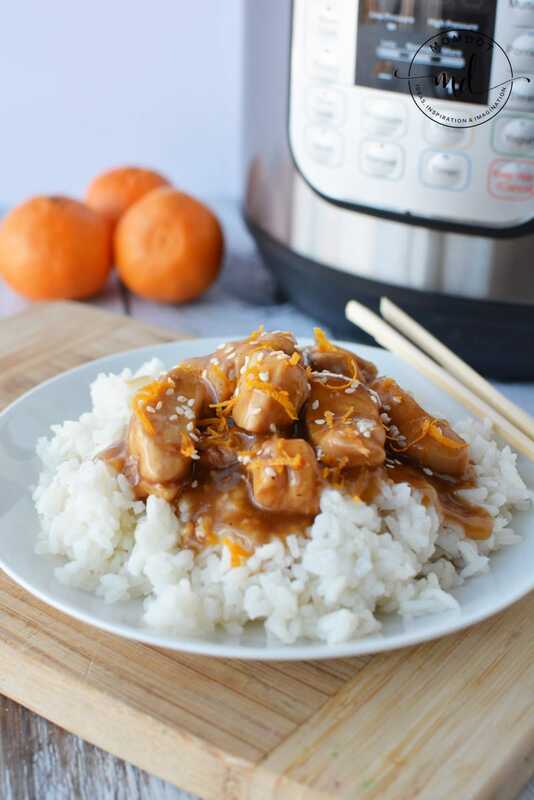 Instant Pot Orange Chicken is a deliciously sweet chicken that can be perfectly paired with easy fried rice and egg rolls for tonight’s dinner menu. You will love the ease of how pressure cookers work and the time you save without sacrificing flavor. Before you get started on making this instant pot recipe, you need an instant pot. Or rather, a pressure cooker. My grandmother gave me a super huge heavy duty power pressure cooker that gets the job done. If I am being honest, I get a little scared around them. One of the most popular pressure cookers is the Instant Pot brand . This chicken recipe is centered on that one, but you can translate to any type. Wolfgang Puck , Cuisinart , and Fagor all make them and Amazon carries a ton . Just make sure you read and understand your brands instructions prior to use to make sure you are using them safely. You can also read tons of tips and tricks in this pressure cooker guide. Pressure cookers get extremely hot and therefore I would not consider them child safe for cooking. If you do not own a pressure cooker, you can purchase one on Amazon here. Pressure cooker meals are on the rise in popularity but pressure cooker recipes are not as easy to find. 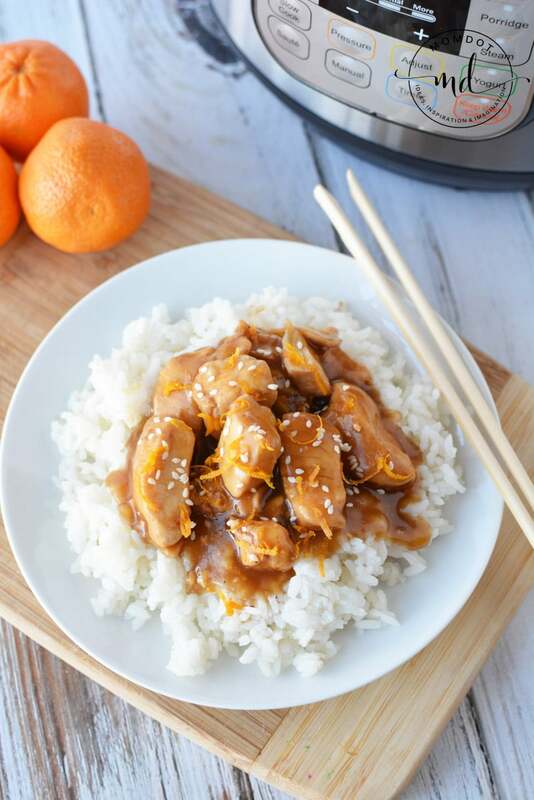 That is why we are starting to take some of our fan favorites and translate them into Instant Pot recipes so you can easily prep and cook your dinner with brand new delicious choices like our Orange Chicken. Need a side that pairs perfectly? Try this Air Fryer Crab Rangoon recipe! Personally I love an at home Asian dish! 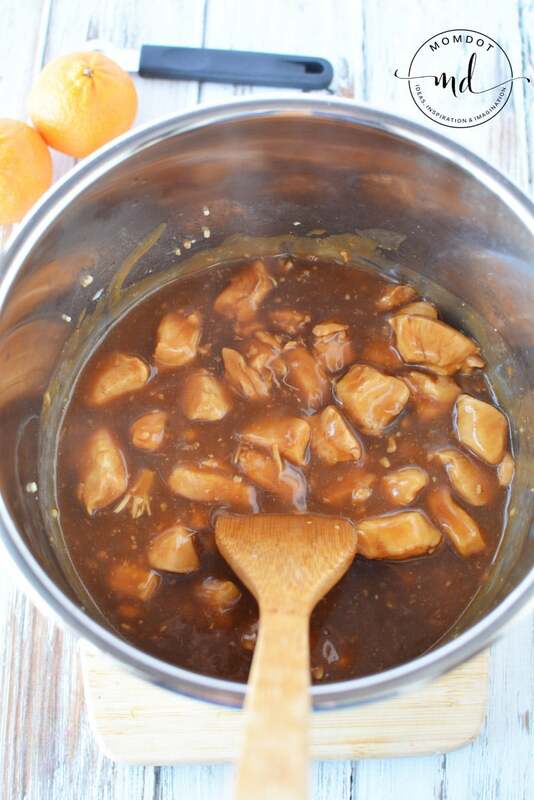 And this Instant pot recipe for Orange chicken is so sweet and filling. Additionally, if you are kitchen creative, this recipe can easily be translated to a honey chicken or a sweet and sour with a simple change of the sauce. Or try this chicken recipe on for size! 1/4 cup corn starch dissolved into 1/4 cup cold water. Let’s get started! If you want this recipe to print, just scroll below and you do not have to worry about all the images. I like to print recipes personally for my kitchen because I hate devices getting sticky sauce as I go through it. Place chicken, oil and garlic into instant pot. Sauté ingredients until chicken is brown. Add orange juice, soy sauce and brown sugar. and close the pressure release valve. Set instant pot to manual, high pressure for 5 minutes. When cooking cycle is complete, quick release the pressure. Open the instant pot and immediately stir in the corn starch mixture. THICKEN YOUR SAUCE TIP: To thicken sauces in a pressure cooker, open and immediately dump in the cornstarch/water mixture. Then stir. Since the IP food is molten lava hot, let it set for maybe a few minutes and it seems to thicken fine. Let set for about five minutes stirring occasionally. Some people will open and hit saute again and then let the dish come to a boil, and that will thicken it as well. It’s really personal preference. Serve over a bed of rice and garnish with orange zest and sesame seeds. Ready for another great recipe? Try one of these for this weeks menu. Finger lickin good! Instant Pot Orange Chicken is a deliciously sweet chicken that can be perfectly paired with easy fried rice and egg rolls for tonight's dinner menu. You will love the ease of how pressure cookers work and the time you save without sacrificing flavor. Place chicken, oil and garlic into instant pot. Sautee ingredients until chicken is brown. Add orange juice, soy sauce and brown sugar. Mix well. Place the top on the instant pot and close the pressure release valve. Set instant pot to manual, high pressure for 5 minutes. When cooking cycle is complete, quick release the pressure. Open the instant pot and immediately stir in the corn starch mixture. Let set for about five minutes stirring occasionally. Serve over a bed of white rice and garnish with orange zest and sesame seeds. THICKEN YOUR SAUCE TIP: To thicken sauces in a pressure cooker, open and immediately dump in the cornstarch/water mixture. Then stir. Since the IP food is molten lava hot, let it set for maybe a few minutes and it seems to thicken fine. Let set for about five minutes stirring occasionally. Some people will open and hit saute again and then let the dish come to a boil, and that will thicken it as well. It's really personal preference.